﻿WHAT IS THE POLAR VORTEX? The polar vortex is a high altitude low-pressure system that hovers over the Arctic in winter. When the polar vortex is strong, it acts like a spinning bowl balanced on the top of the North Pole. 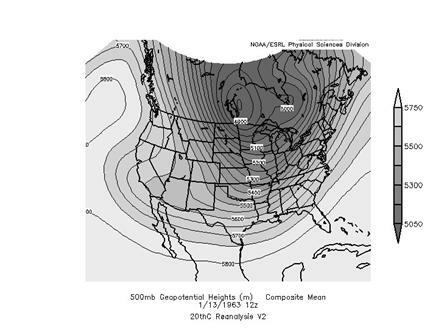 The image (below) shows a strong phase of the polar vortex in mid-November 2013. Dark purple depicts the most frigid air tightly contained in an oval-shaped formation inside the invisible bowl. The light purple line forming the outermost boundary of the cold Arctic air is the jet stream in its normal west-to-east pattern. WHAT IS POLAR STRATOSPHERIC WARMING? A stratospheric sudden warming is perhaps one of the most radical changes of weather that is observed on our planet. Within the space of a week, North Pole temperatures can increase by more than 50 K (90°F). For example, on 17 January 2009 the temperature at the North Pole near 30 km was about 200 K. Over a 5-day period, the temperature increased to 260 K (a change of 60 K or 108°F). These stratospheric sudden warming are caused by atmospheric waves that originate in the troposphere. The waves are forced by the large-scale mountain systems of the northern hemisphere and the land-sea contrasts between the continents and oceans. The waves are also characterized by their very large scales, typically referred to as planetary-scale waves. The stratospheric wind structure filters the smaller scale waves, only allowing the planetary waves to propagate into the stratosphere. As the waves move upward into the stratosphere they have two effects: first they will often push the polar vortex away from the North Pole—bringing warmer midlatitude air pole ward, and second, they produce a downward motion field that also warms the polar region. I define the NAO as the first (varimax rotated) EOF of standardized daily 500 hPa height anomalies in an extended North Atlantic domain (20N-70N, 135W-45E) from 1979 through 2008. This pattern, shown below, is then projected onto recent and forecast data to create the index. The index is standardized by the mean and standard deviation of the base index (again, 1979 through 2008), which is just the first PC. Note that my definition is similar to, but not the same as, CPC’s definition. My index correlates with theirs at roughly r = 0.76. I define the AO as the first (unrotated) EOF of standardized daily 700 hPa height anomalies poleward of 20N from 1979 through 2008. This pattern, shown below, is then projected onto recent and forecast data to create the index. The index is standardized by the mean and standard deviation of the base index (again, 1979 through 2008), which is just the first PC. Note that my definition is similar to, but not the same as, CPC’s definition. My index correlates with theirs at roughly r = 0.75. I define the PNA as the fourth (varimax rotated) EOF of standardized daily 500 hPa height anomalies poleward of 20N from 1979 through 2008. This pattern, shown below, is then projected onto recent and forecast data to create the index. The index is standardized by the mean and standard deviation of the base index (again, 1979 through 2008), which is just the rotated PC. Note that my definition is similar to, but not the same as, CPC’s definition. My index correlates with theirs at roughly r = 0.65. These are SST forecasts from the CFSR for the specified regions. These are daily SST indices which is highly unusual since SSTs don’t change much on a daily scale. Therefore, they may look a little different than the weekly or monthly indices you are probably more used to. Each index is normalized by removing the annual cycle and the first 3 harmonics of the seasonal cycle from SST data over the 1979-2010 base period. Tropical projections use a modified version of Paul Roundy’s algorithm (explained here). The most notable change I’ve made is introducing a time period difference of 10 days between the upper end of the Kelvin waves (20 days) and the lower end of the MJO (30 days). This forces a separation between the two modes. Recent research suggests that this may not be a physically accurate separation, but for the purposes of tropical forecasting, I believe the separation helps to better understand the tropics. These maps are very similar to Paul Roundy’s OLR Diagnostics. I use the CFSv2 upward longwave radiation flux instead of OLR to produce these maps. Updated ~10 a.m. Eastern Time. Analysis goes through yesterday. CFS forecast begins with today and goes out 90 days. The color bar on each of these maps ranges from -30 (Blue) to +30 (Red) W/m^2 anomalies. The CFS forecast maps have anomaly correlation coefficients (ACC) in the lower right-hand corner. Example: 2 day forecast. ACC shown is the average ACC of 2 day forecasts since March 26, 2012. ACCs will extend further as time goes on and I can actually verify. By June 25th (90 days), the ACCs should be filled in for each forecast time. This is modeled after the Wheeler and Hendon (2004) RMM phase space and is most similar to a similar approach that I’ve written about in MacRitchie and Roundy (2012). This approach uses the CFS MJO projections, as used in other figures on this website, to track the MJO. This results in a smoother signal than the WH04 index with less interference from other modes. These stratospheric sudden warming are caused by atmospheric waves that originate in the troposphere. The waves are forced by the large-scale mountain systems of the northern hemisphere and the land-sea contrasts between the continents and oceans. The waves are also characterised by their very large scales, typically referred to as planetary-scale waves. The stratospheric wind structure filters the smaller scale waves, only allowing the planetary waves to propagate into the stratosphere. As the waves move upward into the stratosphere they have two effects: first they will often push the polar vortex away from the North Pole—bringing warmer mid latitude air pole ward, and second, they produce a downward motion field that also warms the polar region. WHAT IS THE NAO ? The North Atlantic Oscillation (NAO) index is based on the surface sea-level pressure difference between the Subtropical (Azores) High and the Subpolar Low. The positive phase of the NAO reflects below-normal heights and pressure across the high latitudes of the North Atlantic and above-normal heights and pressure over the central North Atlantic, the eastern United States and western Europe. The negative phase reflects an opposite pattern of height and pressure anomalies over these regions. Both phases of the NAO are associated with basin-wide changes in the intensity and location of the North Atlantic jet stream and storm track, and in large-scale modulations of the normal patterns of zonal and meridional heat and moisture transport, which in turn results in changes in temperature and precipitation patterns often extending from eastern North America to western and central Europe. Strong positive phases of the NAO tend to be associated with above-normal temperatures in the eastern United States and across northern Europe and below-normal temperatures in Greenland and oftentimes across southern Europe and the Middle East. They are also associated with above-normal precipitation over northern Europe and Scandinavia and below-normal precipitation over southern and central Europe. Opposite patterns of temperature and precipitation anomalies are typically observed during strong negative phases of the NAO. During particularly prolonged periods dominated by one particular phase of the NAO, abnormal height and temperature patterns are also often seen extending well into central Russia and north-central Siberia. The NAO exhibits considerable interseasonal and interannual variability, and prolonged periods (several months) of both positive and negative phases of the pattern are common. The NAO index is obtained by projecting the NAO loading pattern to the daily anomaly 500 millibar height field over 0-90°N. The NAO loading pattern has been chosen as the first mode of a Rotated Empirical Orthogonal Function (EOF) analysis using monthly mean 500 millibar height anomaly data from 1950 to 2000 over 0-90°N latitude. For more information, please visit the Climate Prediction Center NAO page.